Christmas – it is perhaps the most beloved and the most important holiday in Lithuania, which is expected and people are preparing well in advance, in spite of any problems. 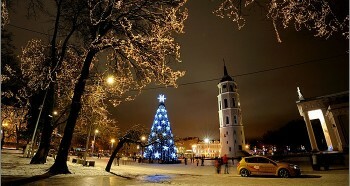 One of the mandatory attributes of this holiday, along with the decorated Christmas tree, Christmas Eve with twelve fish and meatless dishes, gifts, dinner table, a campaign to Mass and visits to relatives and friends, for many residents of Vilnius is a walk through the city, performed in one of the days of Christmas – 25 or 26 of December. As usual, in front of the Cathedral is established traditional nativity scenes with depicting scenes of the Magi worship to the Christ Child. In the old city runs a fabulous train with the children and their parents. And in the ​​Vilnius square for residents and for guests of the capital there is special fairy tale show “Magic Christmas” with special effects in the projection of 4D. “Fabulous” sessions are free of charge – three times in the evening. As the screen for the tale is used southern wall of the cathedral. As Vilnius is a multinational city, tale’s introductory and final titles are made in several languages: Lithuanian, Russian, Polish and English. Christmas in Vilnius has become a real tradition – every year the project makes people wait and believe in Christmas story and share their joy with others. This is the time when all public events in the city are combined into one festival, which aims – to give all residents and visitors to feel the approach of Christmas. There is also a Christmas market, located near the Cathedral Square. Visitors can wander on the carousel, to congratulate their loved ones, receive Christmas gifts and even get a glass of warm Glintwein.